Nazimî Yaver Yenal’s designs from his years as a student at the Sanayi-i Nefise in the 1920s shed light as much upon his search for the style/identity, as they upon the architectural proclivities of the period. These drawings allow us to assess the impact École des Beaux-Arts had, as a late 19th-century pedagogical reference point, on the academic education embraced at the Sanayi-i Nefise in the 1930s, the only institution of architectural education in Turkey at the time. With its roots in the West featuring variations of an eclectic architectural concept, this prevailing methodology was restructured by adapting it to the Ottoman architectural heritage. The designs developed at the Academy were focused more on façade rather than plan. 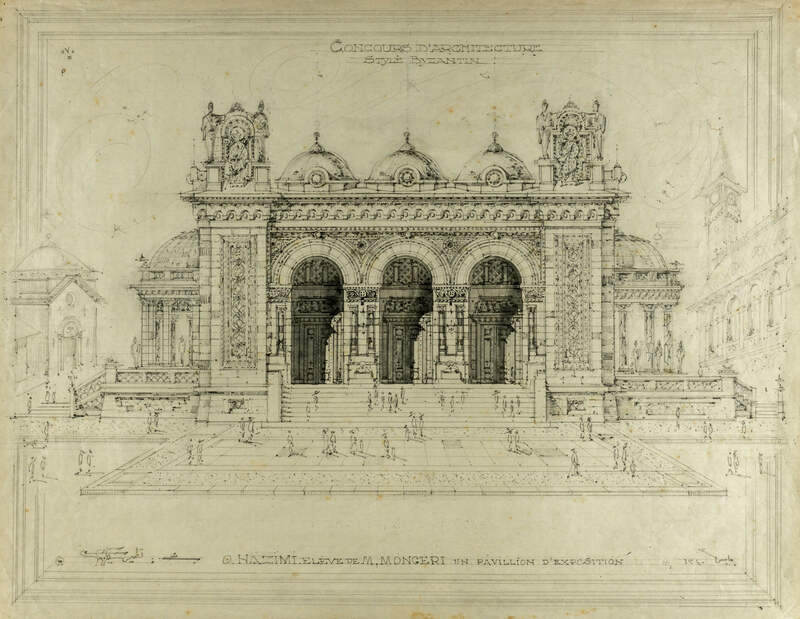 Their styles notwithstanding, while some of the façades in these drawings were transformed into ostentatious compositions resembling stage décor, they also include details structured with reference to a range of different architectural practices. As one of the most successful students of this period, Yenal was trained at the workshops of Vedad (Tek) and Giulio Mongeri at Sanayi-i Nefise. The entirety of the school projects always featured French titles. The majority of the drawings are in historicist style and particularly mentioned the name of the project instructor with the inscription “O. Nazimî, Élève de M. Mongeri” (O. Nazimî, Student of Mongeri). Nazimî Yaver’s school projects are important and rare examples to have survived to date, reflecting extremely well, partially due to his accomplishments throughout his education, the expectations the Academy had of the students. For more information about our exhibition, please visit our web site!